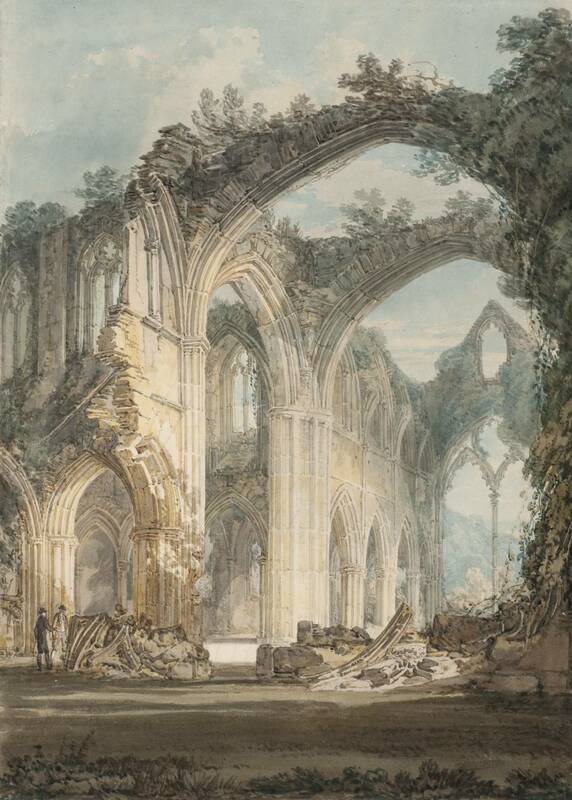 The viewpoint of the composition allows Turner to explore the planar and spatial relationships of the walls and the dynamic rhythms of the arches. By filling the composition with the ruins of the the chancel and crossing Turner emphasises the mass of the architecture. This is strengthened by placing the ruin in the foreground of the composition to emphasise the grandeur of it. Such reaction to the ruin follows contemporary ideas of the sublime. "Interior of Tintern Abbey, Monmouthshire." Victoria and Albert Museum. Web. 13 July 2018. Powell, Cecilia. Turner. Pitkin Guide. Norwich: Jerrold, 2003.